JEGS Zinc Fuel and Transmission Cooler Tubing Kit 5/16 in. Diameter x 25 ft.
JEGS 63062 - Black Fuel & Transmission Cooler Tubing Kit 5/16 in. 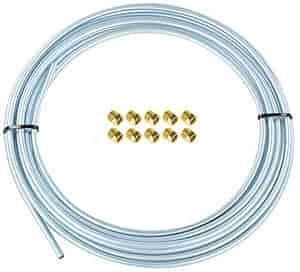 Diameter x 25 ft.
JEGS 63067 - Silver Fuel and Transmission Cooler Tubing Kit 5/16 in. Diameter x 25 ft.
OE-type double wall copperized steel tubing coated with galvanized zinc for superior rust protection. For the professional touch... Same construction as the original plus durable gloss black or silver powdercoating that resists chipping for many years of service. 63034 is rated 5.0 out of 5 by 2. Rated 5 out of 5 by pickupsearch from Great fuel line Used it for our old pick up and it was just what we needed. Rated 5 out of 5 by 62Belvedere from Perfect size to replace stock 62' Ply lines I was adding a trans cooler and wanted to stick with hard lines so I ordered this kit. Plenty of material to run both transmission lines, cooler lines, new fuel lines from the pump to carb plus mess up an additional 4' of lines by bending them wrong lol. These bent easily, no problems doing double flares. Plenty of male fittings, I only wish they included some female fittings but I was able to re-use my old ones. Looks clean. Can this line be used as efi fuel line on an LS project? This can be used, but may not be large enough to supply the correct amount of fuel. Will these fittings work for a 700r4 transmission?